The Observer has uploaded a cool slideshow of additional pics they had from this week’s article on Dallas’ bicycle movement. Do you really think it’s cool that TheObserver wants to represent “the Fight for the Future of Biking in Dallas” with photos of bloody knees, bike polo, and people drinking in bars? That’s a good point, Mark. I was referring more toward the composition of the photography itself, rather than the content. 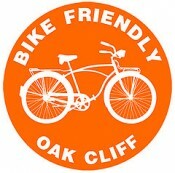 I agree that it would have been nice to see more of the everyday Bike Friendly cyclists represented. The sub-genres are probably more photogenic, in regards to their actions and style. I think that, since the Observer overall is aimed at a youngish crowd, the bulk of the images chosen were probably in line with their target market. until we build up an infrastructure like they’ve done that feels safe for all cyclists, the bulk of riders out there will either belong to a hip young crowd, or a sport/spandex wearing one.